Hi Tech Air Solutions was created to provide a line of products to help alleviate the rising problem of indoor air quality and to help so many affected to have a more healthy life. There have been millions of people affected by the toxins in the indoor air we breathe. We have many years of research, development, and testing with amazing results from Hi Tech Air Solutions equipment. We have the opportunity to help improve the overall health as well as prevent future health problems and look forward to doing so. Hi Tech Air Solutions is experiencing expediential growth and because of the large demand for our product we will continue to develop new models designed for specific industries for the betterment of that industry. As a result, we have the opportunity to change many industries as well as improve the overall health of millions of people. 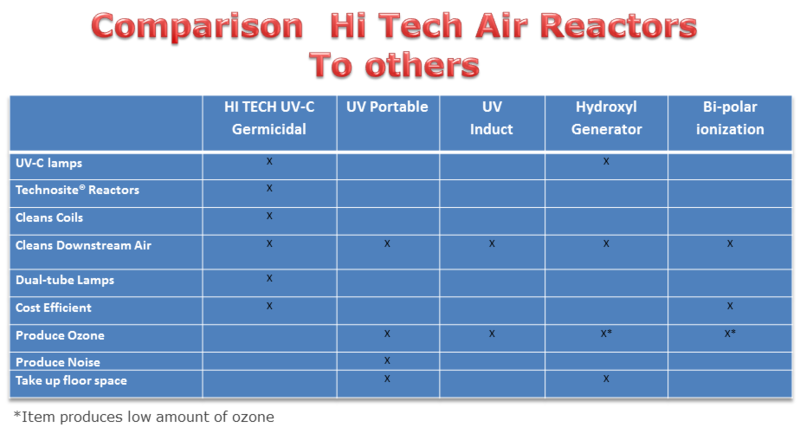 Hi Tech Air Solutions, LLC is a new company, however, with extensive research over the past five years have developed, tested and made available through their proprietary Technosite formula reactor pads technology that reduces bacteria and virus cells up to 99.7% and decomposes bacteria, fungi, virus, or mold. The design of the air purifying units incorporates the proprietary Technosite reactor pads and UV-C2 germicidal lamps to produce the most advanced environmental technology in resolving health problems caused by human damaging substances, allergens, mold, bacteria and viruses and many more. Not all photocatalyst coatings are created equal. Titanium Dioxide (TiO2) is a photocatalyst under ultraviolet light. When TiO2 absorbs Ultraviolet (UV) radiation from sunlight or illuminated light sources, it will produce pairs of electrons and holes (electron-hole pairs), which are mobile charge carriers carrying negative and positive charge respectively. The hole has strong oxidizing power and the electron has strong reducing power. When a photocatalyst is exposed to light in the presence of water vapor, two highly reactive substances are formed: hydroxyl radicals (OH) and a super oxide anion (02-1), it can lower the chemical activation energy to enhance chemical reaction or accelerate the reaction rate. This allows the oxidation of airborne VOCs and toxic organic matter to convert into carbon dioxide and water. Photocatalyst reduce bacteria and virus cells up to 99.7% and decomposes the bacteria, fungi, virus, or mold so that nothing remains. Hydroxyl radicals accelerate the breakdown of VOCs by destroying the molecular bonds. These newly liberated airborne hydroxyl radicals can rupture and destroy the cellular material of any germs they encounter. TiO2 has a very high refractive index meaning the UV light shines over a greater area naturally rather than installing metal reflectors disrupting natural airflow through the primary filter bank to the first set of coils. As stated above, oxidation takes place when UV light and a photocatalyst react. This is precisely why we do NOT recommend placing UV bulbs in close proximity to coils as other manufacturers suggest. It is easier, less expensive, and sensible to replace reactor pads in the filter rack than coils in the HVAC unit. TiO2 photocatalyst nanotechnology is tested and proven to provide 99.7% reduction against the world’s “Superbugs” like Methicillin-resistant Staphylococcus aureus (MRSA), New Delhi metallo-beta-lactamase (NDM-1) and several brand new bad bugs like NvN1 out of India. (2) the equipment cleans air better than UV light, hydroxyl generators, and bi-polar ionization. HI TECH equipment utilizes UV-C germicidal lamps and proprietary Technosite® impregnated reactors (photocatalysts). This combination is far more effective than UV light alone or hydroxyl generators. Technosite® is a photocatalyst under ultraviolet light. When Technosite® absorbs Ultraviolet (UV) radiation from dual-tube UV-C lamps, it produces pairs of electrons and holes (electron-hole pairs), which are mobile charge carriers carrying negative and positive charge respectively. The hole has strong oxidizing power and the electron has strong reducing power. Technosite® has a very high refractive index meaning the UV-C light shines over a greater area naturally. UV irradiation will keep HVAC coils clean, but are only effective where the light shines - not downstream in the dark. HI TECH equipment solves this problem. Oxidation takes place when UV light and a photocatalyst react. This is precisely why we do NOT recommend placing UV lamps in close proximity to coils as other manufacturers suggest. HI TECH equipment utilizing proprietary Technosite® and dual-tube lamp technology is the most effective solution in resolving health problems caused by human damaging chemical substances, allergens, harmful bacteria, and viruses. Our dual-lamp system produces twice the irradiation as competitor single-tube lamps. When exposing Technosite® reactors to light in the presence of water vapor, two highly reactive substances form: hydroxyl radicals [OH]- and a super oxide anion [O2-1] (more effective than hydroxyl generators). The super oxide anion can lower the chemical activation energy to enhance chemical reaction or accelerate the reaction rate. This allows oxidation of airborne VOC s and toxic organic matter to convert to carbon dioxide and water. The OH- radicals and travel downstream in light or in the dark to react with organic contaminants. Technosite® produced hydroxyl radicals accelerate the breakdown of VOCs by destroying the molecular bonds.Â These newly liberated airborne hydroxyl radicals can rupture and destroy the cellular material of any germs they encounter. This process removes smoke, odors, bacteria, mold, and other airborne contaminants. By contrast, UV light alone only works where it shines and is effective only when bacteria or mold are in very close proximity to the lamps. Hydroxyl generators only produce hydroxyl molecules and therefore take much longer to “clean” the air than HI TECH equipment. HI TECH’S proprietary TechnositeÂ® reduces bacteria and virus cells up to 99.7% and decomposes bacteria, fungi, virus, or mold so that nothing remains.